Thanks to Richard for this nice photo of Citybus 415, the first double decker in the new livery (not counting the two blue ones). I have to say this livery really suits these buses. 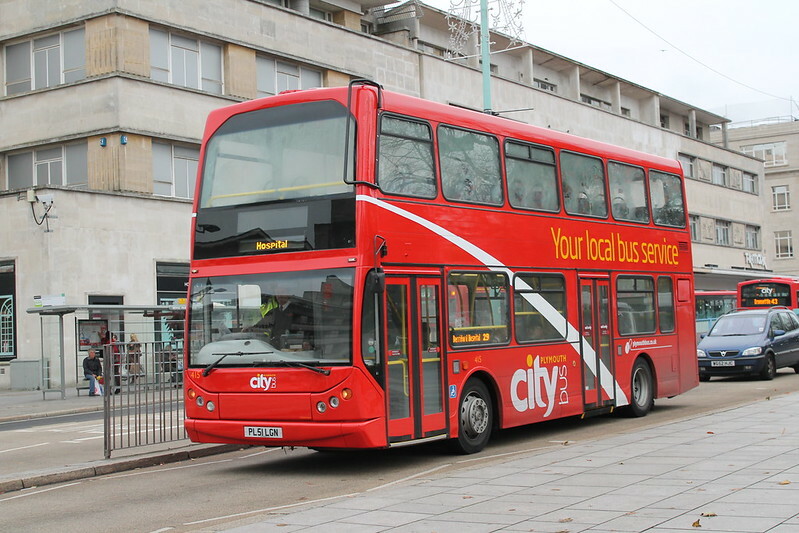 I know many still dont like the white stripe but its a clean livery which is easy to apply and is instantly recognisable as Citybus with its nice large fleetnames. As long as they dont plaster adverts over the “your local..” lettering! Im not a fan of the "Your Local Bus Service" lettering to be honest. It looks cheap. It is even worse on this bus what with them having made it about 3 times the size it is on other single deck examples, simply to fill the gap. When it comes to side advertisements, where will they go without compramising the livery now! If it was smaller however and sat at the back, maybe only an inch or two from the windows as apposed to central, there would be a large amount of space for the adverts! What adverts? I thought Citybus was looking to emulate fellow Go-Ahead Group operator and industry leader, Brighton & Hove, by no longer taking commercial adevrtising. Okay, you lose some income by doing so but your buses look a lot better and you can use the space to sell your own services, key cards etc. It's not held B&H back and for a quality, professional operator I have no doubts it's the right way to go. Just look at what happens over at First when they try to combine route branding with space for adverts - the whole thing comes out looking like a complete mess and the information is lost in a busy mixture of jarring colours/images/fonts. Any one else noticed they've missed a bit? Also, on the point of route branding. Some of the 08plate e200s have some branding for the 45 on the rear boot cover. Noticed it today as they were working the 35!! 143,144 and 145 are all branded for the 45. Enviros on the 35 is certainly a big change from the SLFs used beforehand, though SLF 18 on the 20/42s thismorning broke down and 145 was sent as a replacement. I haven't heard anything about Citybus giving up on private advertising, if they have, this is a bad move! Does anyone know where the deckers have gone from Route 26? I've seen a few very busy buses. And loads of grumbles on the Citybus Facebook page. Everywhere else pretty much. Citybus now have 2 or 3 working the 44/A normally. 40&41, 42/A/D, 61&62 see one a day at least. 34 seems to now be all deckers, as does the 29. I think the deckers should have remained on the 26 and continued through to Plympton services. Citaros should have been removed from Plympton services and placed on 44/A. I noticed on Tuesday that at least 3 SPDs were operating the service 43, rather than the usual Eclipse's. 43A had a 56plate Citaro. Following from what you have said though. At about 1530 every single 26 that I saw had a full standing load yet the deckers on the various outbound services very, basically, not required. I am sure the vehicles will change soon enough to meet capacity requirements though! Yesterday we had either 408 or 409 on the 20/42/A, they need 7 buses for the 20/42/A, which all seem to be SLFs. In this second half of the week we're seeing more R-reg SLFs; indeed today we saw 4 R-reg SLFs, those being 23,24,26 and 27, and 3 N-reg's I couldn't quite see which ones they were. I don't see the 42D as these don't continue out to Plympton. Citaros are quite popular in Plympton, and while I agree they do suit the 44s Citybus seem very reluctant to move them. Even on Sundays in Plympton the 21/A is always handled completely by Citaros. I agree, deckers should've definitely remained on the 26, if passengers in Plympton don't like them (like they do), tough! If they don't like sitting upstairs there are some downstairs seats which are mostly occupied by the elderly so I really don't see their problem. With regards to them being on the 40etc,/61/62s, they ought to really look at where the extra capacity is needed and allocate them accordingly. Maybe recreate the running boards for their busiest single deck routes, e.g. it can spend the day on a service, then between 4 and 6PM to cover as many routes as possible? At first that sounds strange though there are some strange 'peak changeovers', for example up until last Sunday the 1625 16 from Royal Parade on Saturday's at least came off a 50. This morning on the 26 was a total shambles, First bus strike, Citaro was wedged at St.B, 3 prams and the driver thought it was acceptable to let a 4th on without being folded. It was a total trip hazard, people standing in the aisle with 4 push chairs, it was that busy people where up against the doors, and despite another 26 being empty and right behind, he continued to let people on! Seems to me there's a shortage of buses and as such, the 29, 152, 34 etc all having the Deckers, there's not enough to work the 26, bearing in mind they are also needed for the school runs. Whever a decker has been on the 21, there's been complaints, perhaps another reason why, i'm dissapointed in Citybus to say the least, certainly after todays bus strikes. Hope Mr.G is reading this. Saw 3 single deckers in a row earlier. Are Citybus sending extra buses out because of capacity problems today I wonder? NOt sure Phil, but from the complaints on the FB page, it would seem that most of their services are running around with full buses! Lets not forget that, for all the capacity issues that may have been experienced, there was a service. They ran duplicate services, and used as many double deck vehicles as possible. CityBus were proactive in providing as good a service as possible during the strike. Where were first? "Transforming Travel?"